Elliot obtained an MPhys in Applied Physics in 2003 from the Nottingham Trent University and his PhD in the field of atomic physics and nuclear magnetic resonance in 2007 from the University of Nottingham. He has industrial experience working for an international research and technology organisation where he was a key member of a highly successful team of funding specialist, developing R&D projects for a wide range of innovative small and medium sized manufacturing enterprises. 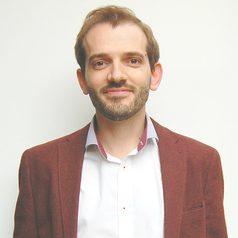 Elliot joined the Loughborough University in 2010 in a business strategy development role for the Competitive Sustainable Manufacturing research cluster. In April 2012 appointed as a Lecturer in Sustainable Manufacturing within the Wolfson School of Mechanical and Manufacturing Engineering at Loughborough University. Eco-intelligent manufacturing: real-time energy management for flexible and reactive factories. Improve the uptake of renewable energies by enabling production to be responsive to unpredictability in supply. Modeling of energy consumption on the plant, process and product level. Energy capture and reuse within manufacturing enterprises. New manufacturing/consumption models – understanding what the future manufacturing industry will look like.